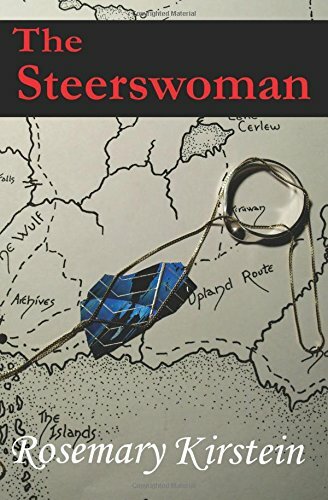 The paperback version of The Steerswoman is now available on Amazon. It’s been available at CreateSpace’s own online store for a week or so — but Amazon’s always been my best sales channel, so I’m hoping for a decent number of sales. Some people still aren’t into ebooks, generally, bless ’em. And why should they be denied access to Rowan’s world? I do have plans to do the rest of the series as trade paperbacks, as well, and I’m currently aiming at December, as I have Many Things needing my attention at the moment. I’m really pleased with the look and feel of the book. This is fun. In other news: back from the mighty eclipse trip, which involved two days driving there, two days driving back; two nights in motels; two nights visiting pals; four nights in Smoky Mountain National Park; days and days of driving to identify good eclipse-watching spots; and one day of sheer luck in hitting an unexpected excellent viewing spot. More on that soon. 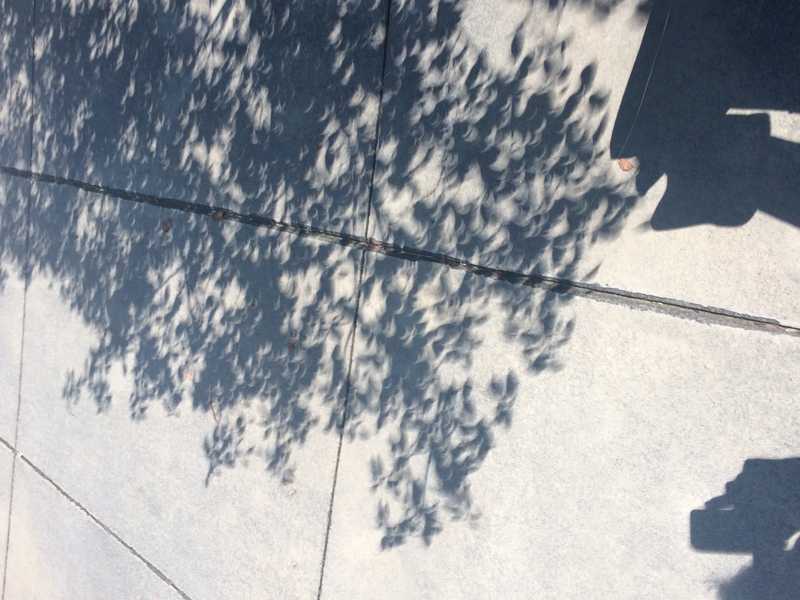 Shadow of a tree during the eclipse, where each gap between the leaves acts as a little pinhole projector. Click to embiggen! What have I been doing lately, while not posting on my blog? Yep. Now available in paperback. Real matter that you can hold in your actual hand. 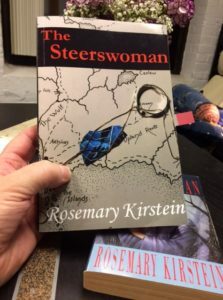 I’ve been hearing that a reasonable number of people wished that there were a paperback version of The Steerswoman, so I finally knuckled down to get that going. I”ve used CreateSpace, a service which many people have spoken of highly. It seems pretty straightforward, even for people who are not tech-savvy — and for a nerdy former programmer like myself, it’s especially easy. Conceptually, that is. Much dog-work is involved, and much careful focus on detail. But that’s what you get for being hands-on. I actually enjoyed the process. The main downside was that I had to get it done in a compressed amount of time. Thus, The time-crunch. I thought I’d have plenty of time, but when I got my proof-copy, I discovered that I’d chosen a font size that was uncomfortably small — a fact not evident when previewing the layout online. Once I had it in my hand, then I could tell. Also, I lost my right-margin justification. And then time was getting short. So I pulled out all the stops, spent a couple of days working too many hours, guzzling too much coffee, while resizing the font, rechecking the formatting, re-proofreading everything, redoing the cover (because the spine was going to be wider). And wrestling with the map. Never skip a chance to proof-read. Never, never. There’s always another typo. Trust me. I had to take the new proof with me… I actually finished that part at 11:30 last night, by flashlight, at a picnic table, in the campground. But it’s done! I gave it the official OKAY a few minutes ago in a coffee shop in Tennessee. It’s already available in CreateSpace’s own online store. It should be available on Amazon.com sometime next week. I get a slightly better royalty from CreateSpace, but if Amazon is your go-to, I say go to! Next week. In other news: hey, eclipse! So, having published my paperback (hooray! ), I am now going to be mostly unavailable, due to camping out near where the eclipse is happening. You should try to catch it if you can. 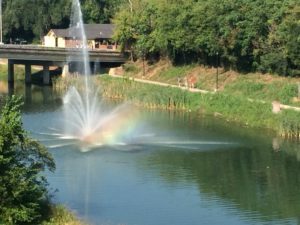 Read all the info on it for your area. 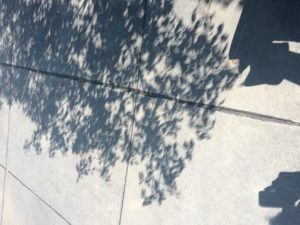 This is my third total eclipse, and I they are wonderful beyond description. You don’t need me to tell you who won, right? It’s posted everywhere! Like, at Tor.Com. For more details, Tor.com really is my favorite site for keep up to date on SF/F biz doings. 1 comment	| tags: Hugo awards 2017 I am not there. 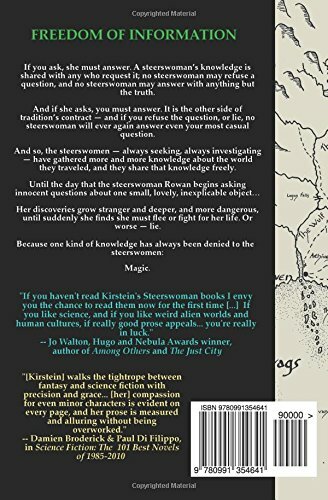 Ages ago, at a dim and distant Readercon, Kathei Logue (music booking agent, SF fan, Readercon volunteer) came up with the idea of the Kaffeeklatsch as a program item: sign up to hang out with an author. One author, 12 slots for fans, one hour. Coffee usually provided. I haven’t seen or heard from Kathei in a long time, but her idea lives on, and other conventions have picked it up, too. So, thanks, Kathei. I always have fun at the kaffeeklatsches, whether I have just a couple of attendees, or a whole tableful. I think it’s because readers, when I meet them, turn out to be so cool, so interesting. And I seemed to have been in a particularly chatty mood this time, as well. As ego-boosts go, it’s hard to beat a table full of really smart people paying close attention to every word you say! At one point, we were talking about my reading, and someone asked for some idea of the locations mentioned, and I pulled a map out of my bag. Ah, they all went, and gathered in. What a lovely sound. Of course, they were not expecting me to unfold the map and keep on unfolding it until it basically covered half the table. Heh. You know, that’s very silly of me… I really wish, in retrospect, that I had taken a photo of every Kaffeeklatsch I’ve taken part in. I’m going to do that, going forward (but I will always ask people if they mind being included, because I know that some people just don’t want to be in photos that might get shared online. Their choice).